Get prepared, the last Day of the Four Freedoms to be organized by our project EU3doms is coming up. It will take place in Lendava, Slovenia, on the 24th of October. The event aims to discuss successes and possible pitfalls related to the realization of the four freedoms during the plenary session. Afterwards, young participants, not only locals but coming from partner towns, will receive information on their opportunities provided by the four freedoms and backed by EU programmes targeting youth. Concrete cooperation opportunities will be discussed among the representatives of partners and associated institutions in the field of education. Afterwards, to enhance the involvement and information of young participants, targeted workshop will take place where students coming from different cities and countries will have a chance to further enlarge their knowledge on EU freedoms, EU programmes and decision-making procedures. We also plan to put attention to establish future collaboration among them. Parallel to this, project partners will conduct a SWOT analysis on the realization of the four freedoms in their settlements, regions. We aim to find out possible strength that could be further exploited as well as existing hindrances where we still have to seek solutions. 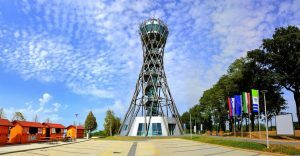 The day will be ended at the Vinarium tower where participants will be able to see the landscapes of 4 different countries at once since the watchtower Vinarium Lendava, standing 53.3 meters tall, offers an incredible 360° view of the colorful landscape that stretches from the settlement of Lendavske gorice, where the tower proudly stands, all the way to the river basin of Mura, and encompasses a wonderful view of the plains and hills of Slovenia, Hungary, Croatia, and Austria. Such a good occasion to think over EU, EU citizenship and the freedoms provided. The conference is open and free to the public. See you there!